During my travels, so many people I met only stayed in Yangon (the former capital) for one night before moving on. What a shame. I spent six days there, and found it to be the perfect introduction to this beautiful land. I discovered the quirks, tasted the street food, learnt a few words, and adored the city. So much so that I spent six more days there before flying out, bought myself a longyi (traditional dress) and my cab fare is already tucked into my passport for my anticipated return. Sure, go to the Schwedagon Pagoda, and Bogyoke Market, but more importantly abandon your sunglasses, get lost, taste the street food, always look up, and don't forget to smile. One of the views from my hotel room. "Would you like to see buffalo swimming"? Would I what!! I could hear the majestic beasts huffing and puffing as they submerged themselves in the water. Months later I can still hear the sound and remember every moment of the hike. I went on two three day treks. One from Kalaw to Inle Lake, and one in Shan State, around Hsipaw. If you can only do one of those I would suggest the Kalaw to Inle Lake, as the scenery is a little more intense, although the latter is more authentic (and challenging). My advice is to make some friends before booking the hike (which is easy to do as so many people are walking around each afternoon trying to find the right trekking company). Ensure that your group is not larger than five, and that your guide speaks English as there is so much you are going to want to ask. I used A1 trekking, and they were amazing. As i was eating my breakfast on the third day of the Kalaw to Inle Lake hike. Morning fog on the third day from Kalaw to Inle Lake. 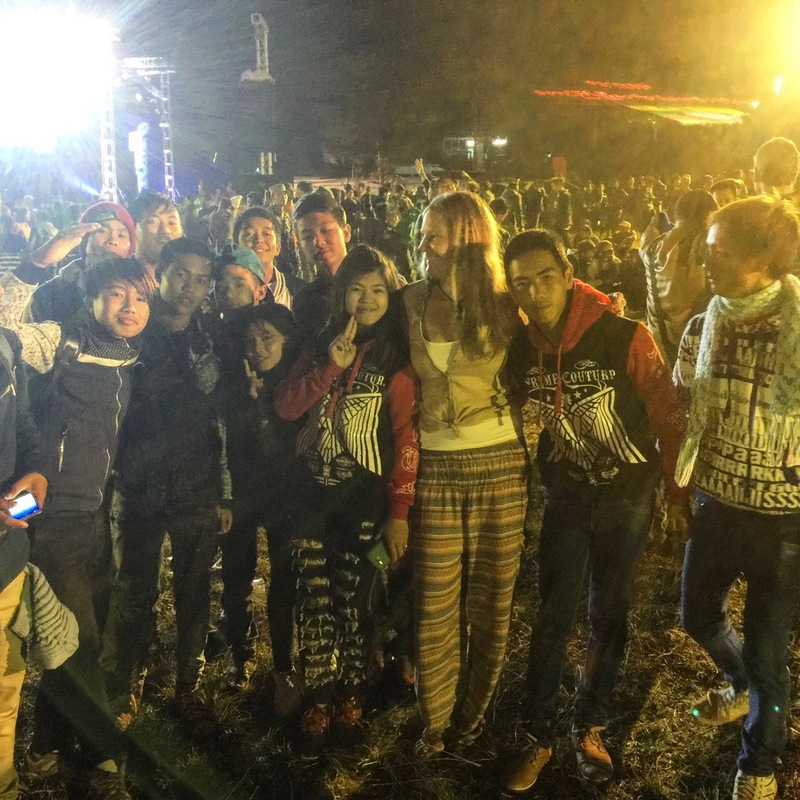 The Balloon Festival in Taunggyi in November is a once in a lifetime experience. Thousands upon thousands of people watch and revel as hot air balloons are released into the air. Upon our arrival, we were approached for a photo, and thought nothing of it. But as we got further into the dance area hysteria ensued. At one stage I had thirty cameras in my face, which I welcomed after a Summer in Scandinavia amongst the world's most beautiful people. One girl stared at us, screamed and started crying with sheer happiness. But then it was my turn to start nearly crying with joy when I saw that there was a human powered ferris wheel. It was on my list. Basically, the motor is eight Burmese boys resembling smoking spider monkeys in flip-flops who use the momentum to turn the wheel. Many blogs and sites suggest flying within Myanmar, but I beg to differ. Sure, some of the train rides are downright uncomfortable, especially the overnight ones, but you have to pick your battles. My intention was to get the train from Thazi to Kalaw, but that went pear shaped as I was dropped off in Thazi at 4am, did not manage to find the train station five minutes walk away, and ended up on a shuttle instead with what seemed like a twelve year old kamikaze driver (i would advise against such transport). Luckily I got another opportunity to go from Hsipaw to Pyin Oo Lwin. What better way is there to spend a day on a rickety train with locals watching the scenery, and feasting on 30 cent noodles from the vendors at the stops? An added bonus was going over the Gokteik Viaduct which was completed in 1900. Scary as hell, especially when everyone moves to one side to get photos. I repeat the slow boat. There are a few options, costing up to forty dollars, but we took the one that can take anywhere between fourteen hours and two days, depending on the water levels. It didn't bother me. It departs incredibly early, and as you arrive there are families sleeping. Take a seat, and settle in for the day. No need to bring food, as at every stop there are merchants vying for your business. One woman saw me eyeing off her samosas, and was by my side in no time. Please remember to bargain, as the, "Shuddup and take my money" approach might see you paying triple what the person next to you paid. Did I say might? Floating down the Irrawaddy taking in the scenery, seeing a glimpse of every day Myanmar, and the simplicity of these beautiful people going about their business gives you a sense of calm. I kinda wish it had taken two days, and the next day at Bagan paled in comparison.